With the start of the fall semester, there have been some changes around campus. Baldwin Hall is being renovated to add 10,800 square feet that will support the School of Public and International Affairs with technology-enabled active learning classrooms; space for graduate teaching assistants to hold office hours with undergraduate students; and common areas for faculty, staff, students and alumni to convene for academic discussions, presentations and events. The existing building will be renovated to provide academic departments with modern instructional facilities, greater accessibility for individuals with disabilities and a more efficient mechanical system. Classroom renovations on the first floor of the existing building are expected to be completed during the 2016 fall semester. Work on the addition began in June 2015 and will run through spring 2017. The second phase of the Terry College’s new Business Learning Community, located near the intersection of Lumpkin and Baldwin streets, will open fall semester 2017. The centerpiece of Phase II’s three buildings, Amos Hall, is named in honor of Terry alumnus Daniel P. Amos, chairman and CEO of Aflac. Amos Hall and the two adjacent buildings that comprise this second phase encompass nearly 140,000 square feet. The structure will be home to the undergraduates of the Terry College of Business and its faculty. There will be eight classrooms and two large auditoriums, the undergraduate commons and cafe, the Capital Markets Lab, the Music Business Program as well as team study rooms and faculty offices. At the Health Sciences Campus, construction is underway on a build-out of the former Navy Supply Corps School commissary building for use by the College of Public Health’s Institute for Disaster Management. UGA broke ground Dec. 1, 2015, on the Center for Molecular Medicine, a 43,000-square-foot facility that will continue to advance UGA’s efforts in human health research. When finished, the building on Riverbend Road will house up to 10 research groups whose primary goal will be to conduct translational research that positively impacts human health. The facility will include laboratories, faculty offices, shared cell culture facilities and other shared spaces that support research. The building construction began in July and should be complete in fall 2017. On the first floor of the Tate Student Center in space that was previously conference rooms, UGA’s Exploratory Center will open Aug. 11. The center houses 13 advisors who assist students in choosing majors and career paths. The center also serves students with a pre-business and pre-journalism and mass communication track. Future plans call for the Exploratory Center to house advising services for pre-health, pre-law and transfer students. The Athletic Association is building a 109,000-square-foot Indoor Athletic Facility on the Woodruff Practice Fields. The facility will be connected to Butts-Mehre Heritage Hall. The facility will include a full-length football practice field, a 65-meter track runway, retractable batting cages and other features to support student-athletes across athletic teams. The project will cost an estimated $30 million and the Athletic Association expects to eventually fund the entire cost of this project with private donations. The project is scheduled to be completed early next year. The recreational sports department has renovated and opened a new Functional Training Room on the second floor of the Ramsey Student Center. This space includes state-of-the-art athletic conditioning equipment (battle ropes, jump boxes, kettle bells, Bulgarian bags, a turf strip and sled, etc.). New small group training fitness classes will be offered in this studio. A new pool filtration system has been installed in the Gabrielsen Natatorium. This new pump system, which services all three pools, is both environmentally friendly and more energy-efficient, using UV light along with chlorine to purify the water. Other changes to the facility include a new floor and paint for Gym Central and floor refinishing in the other gymnasia. Digital signage has been added throughout the facility, and new static signage is also being added. The academic wing of the Ramsey Student Center has also been renovated to include new flooring, paint and signage. Renovations have been made to the Club Sports Complex managed by recreational sports in conjunction with UGA Athletics. These changes will continue through 2017. 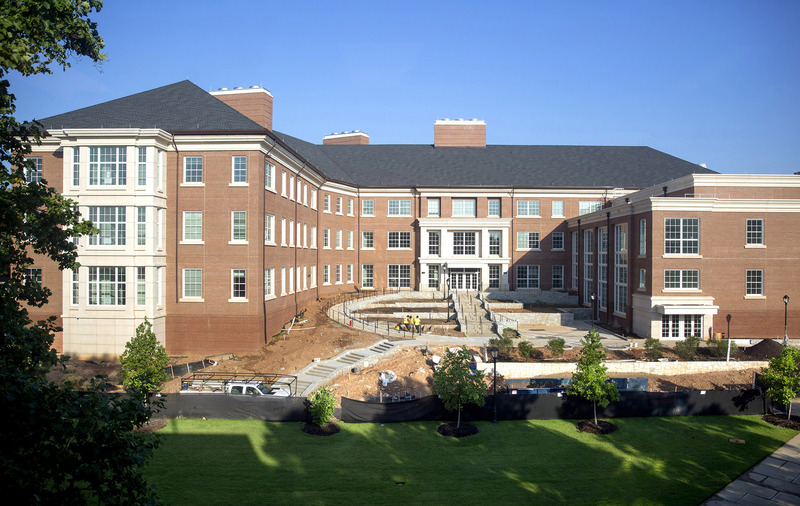 UGA’s Science Learning Center opens Aug. 11. The three-story, 122,500-square-foot building was tailor-made for teaching undergraduate science, technology, ­engineering and mathematics. A dedication ceremony will be held Aug. 17 at 10 a.m. The event will include remarks from UGA President Jere W. Morehead. The center houses 33 instructional labs designed specifically for interactive learning in core undergraduate science courses, two 280-seat lecture halls, two 72-seat SCALE-UP classrooms as well as spaces for informal student collaboration. The SLC is located on the southwest corner of the D.W. Brooks Mall adjacent to Pharmacy South and across from the Miller Plant Sciences Building. Formal instructional laboratories will primarily be used for introductory courses in chemistry, physics, biological sciences and ecology. The College of Engineering is leading a new 1-megawatt solar tracking demonstration project on a 10-acre site off South Milledge Avenue. The project will help determine the optimal orientation and tracking technology for Georgia’s climate and energy demand. The Mimsie Lanier Center for Native Plant Studies held a ribbon-cutting ceremony at the State Botanical Garden, a public service and outreach unit, in February. The purpose of the center is to propagate Georgia native plants for habitat restoration, recover endangered species and introduce native plants to the gardening community. New turfgrass research and education facilities on UGA’s campuses in Griffin, Tifton and Athens are under construction. Outdated facilities on UGA’s campuses will be replaced with labs, greenhouses, classrooms and office spaces to keep the university at the forefront of turf breeding programs around the nation. The facilities in Athens and Tifton will be complete in fall 2016, and the Griffin facility will be complete in spring 2017.